A painting of Christ by Renaissance master Leonardo da Vinci was sold for $450 million at an auction in New York, becoming the most expensive painting ever sold at auction. The painting, Salvator Mundi, depicts Christ as ‘Saviour of the World’. The buyer's identity was not revealed. 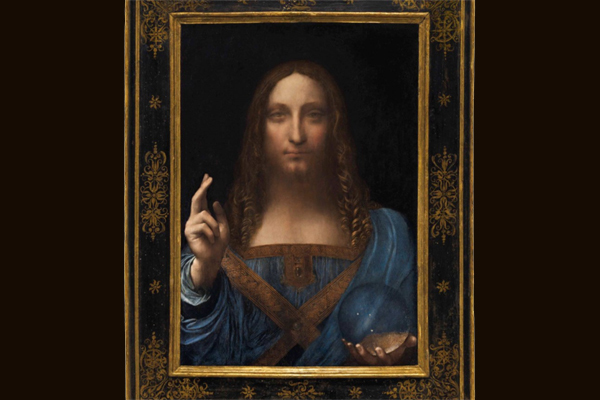 This stunning price reflects the extreme rarity of paintings by Leonardo da Vinci (1452-1519) — there are fewer than 20 in existence acknowledged as being from the artist’s own hand, and all apart from Salvator Mundi are in museum collections, said auction house Christie's. The global interest in a work that has been hailed as the greatest artistic rediscovery of the last 100 years saw a rapt audience of nearly 1,000 art collectors, dealers, advisors, journalists and onlookers packed into the main auction room at Rockefeller Center, with many thousands more tuning in via a live stream. Since the sale of Salvator Mundi was announced on October 10 at Christie’s, almost 30,000 people have flocked to Christie’s exhibitions of the ‘Male Mona Lisa’ in Hong Kong, London, San Francisco and New York — the first time the painting had ever been shown to the public in Asia or the Americas. The inclusion of Salvator Mundi in the National Gallery’s landmark 2011-12 exhibition of Leonardo’s surviving paintings — the most complete display of such works ever held — sealed its acceptance as a fully autograph work by Leonardo da Vinci. This came after more than six years of painstaking research and inquiry to document the painting’s authenticity. It was process that began shortly after the work was discovered — heavily veiled with overpaints, long mistaken for a copy — in a small, regional auction in the US in 2005. Prior to that, it was consigned to a 1958 sale at Sotheby’s where it sold for £45. The previous holder of the record price for an Old Master painting was Massacre of the Innocents by Peter Paul Rubens, which sold for $76.7 million in 2002. The previous auction record for Leonardo da Vinci was set at Christie’s in 2001 when Horse and Rider, a work on paper, sold for $11,481,865. The previous record for the most expensive work of art at auction was set in the same Christie’s saleroom, when Picasso’s Les Femmes d’Alger (Version ‘O’) achieved $179,364,992.